This highly acclaimed atlas distills the vast science of climate change, providing a reliable and insightful guide to this rapidly growing field. 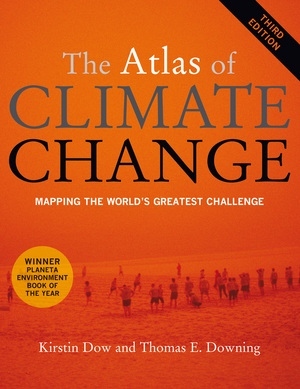 Since the 2006 publication of the first edition, climate change has climbed even higher up the global agenda. This new edition reflects the latest developments in research and the impact of climate change, and in current efforts to mitigate and adapt to changes in the world’s weather. The atlas covers a wide range of topics, including warning signs, vulnerable populations, health impacts, renewable energy, emissions reduction, personal and public action. The third edition includes new or additional coverage of a number of topics, including agreements reached in Copenhagen and Cancun, ocean warming and increased acidity, the economic impact of climate change, and advantages gained by communities and business from adapting to climate change. The extensive maps and graphics have been updated with new data, making this edition once again an essential resource for everyone concerned with this pressing subject. Kirstin Dow is Associate Professor of Geography at the University of South Carolina. She is a lead author in the IPCC Fifth Assessment, Working Group 2 effort on Adaptation Opportunities, Constraints, and Limitations and a contributing author to the chapter on coasts. She is also Principal Investigator of the Carolinas Integrated Sciences and Assessments, an interdisciplinary research effort to bridge climate science and decision-making. She serves as a science advisor on climate change mitigation and adaptation for community and national efforts. Thomas E. Downing is President of the Global Climate Adaptation Partnership and Visiting Professor at Oxford University. He was formerly Executive Director of the Stockholm Environment Institute, Oxford Office and is a contributor to the Intergovernmental Panel on Climate Change and advisor to national and international programs on climate change.